Pep Guardiola could emerge as a target for Chelsea if Jose Mourinho continues to struggle this season, according to Monday's newspapers. Chelsea owner Roman Abramovich will be encouraged to try for a second time to convince Pep Guardiola to accept the job as manager at Stamford Bridge if Jose Mourinho cannot quickly turn around the club’s alarming slump. West Bromwich Albion manager Tony Pulis wants countries to pay the wages of players when they are away on international duty. Paul Pogba made the correct decision to turn down a move away from Juventus in the summer, according to the midfielder’s agent Mino Raiola. 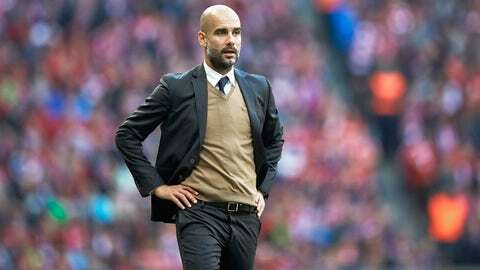 Bayern Munich captain Philipp Lahm has urged Pep Guardiola to prolong his stay at the Bundesliga giants. Real Sociedad manager David Moyes has suggested his job is safe despite his team’s struggles in La Liga this season. Louis van Gaal admitted he was ‘sick’ of answering questions about Wayne Rooney’s form following the goalless Manchester derby. Aston Villa are in advanced talks to make Remi Garde their new manager after Tim Sherwood was sacked. But Villa also want to speak to David Moyes, while Sherwood could be set to take over at Swindon Town. Arsenal have sent scouts to watch highly-rated Schalke 04 winger Leroy Sane who has already said "no" to Liverpool and Tottenham. The Gunners are keen to bring former captain Patrick Vieira back to the club with a view to making the 39-year-old manager in the future. Jose Mourinho could be dismissed in the aftermath of Chelsea’s next match against Liverpool if his side do not win. Dwight Yorke wants to succeed Tim Sherwood: "I know what is expected of Aston Villa." Sherwood is expected to collect around £2m in compensation following his sacking. Former Lyon boss Remi Garde is the front runner to succeed the sacked Tim Sherwood at Ascot Villa.